Smartphone Like android and I-phone are making children Smart or Just Addicted? Do Android Smartphone and I-phone are making children Smart or Just Addicted? 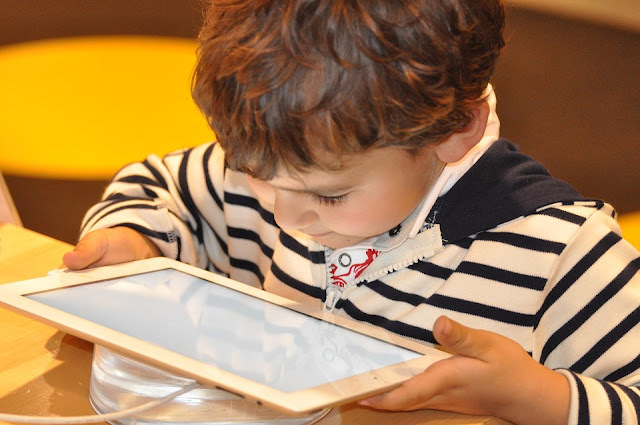 Smartphone’s isn’t smart when it comes to used by children’s because it not only effect children’s emotions as well as their personality to grow. These Smartphone’s are just like cyclones where a child gets traps into it and cant progress in other areas. Through this Smartphone children are engaging themselves in such activities in which they should not involve before a mature age. Today we notice that almost every child who is indulged with the use of Smartphone in early ages may use that device faster than an elders do. This only leads to the child to be in self consciousness mind nor bothering about the other activities on which he should concentrate. Spending most of the time in Smartphone may lead to serious affects in overall learning capabilities of children. This habit ends skill developing capabilities of children. Playing games for most of the time may improve your child brain IQ but the negative impact of this is that it is only one dimensional the overall brain develops when children learns from outside through reading books, playing with friends or family only this in improving overall brain IQ of a child. For good physical development children needs to exercise, play outdoor games, should indulge in physical activities but children who are addicted to smart phones do not give time for their physical fitness they just spend time with their smart phone in surfing through internet, watching videos, playing games which only effects their eyes, body parts seriously over time. Smartphone let u use internet and internet contains various information’s that requires mature age to know but as internet is easily accessible these information too. Some games are available which contains 18+ rating and these games are often plays by small children Due to this your child’s brain can equipped with curtails thin which they should not before turning to 18 years old. All of this seriously affects child behavior and mentality. Continuous usage of Smartphone can led you to invite many diseases Eyestrain. This occurs when you regularly watches you Smartphone display for too long for continuous basis. Headache is also common who regularly use their Smartphone due to which most can’t able to sleep proper and if your children is not sleeping properly that also Leeds to various problems. Children do play games in their smart phones without going anywhere just sitting at one place for hours this can cause back strain, craps etc. therefore special attention is needed by parents. Finally it’s the parents who are total responsible in guiding theirs children future hence they should adopt every possible ways to maintain their children health, mind and physical condition. They should avoid their children from these devices as they only take them away from their parents as well as from society. Because these Smartphone is not making your child SMART instead they just make them STUCK in the way of progressing themselves. It's all on parents that how they are shaping their child's future. Most of the parents due to their busy schedule do not give time to their kids, to cover that loss they instead provide all the other facilities like smartphones,computers etc as a result children gets badly involved in that and starts forgetting other aspects of life. Hence parents should spend sufficient time with their kids, they should play with them and at last they should focus in all round development of their kids.